There are many ways to avoid receiving a trafic citation (ticket). We suggest you read through this page, and follow the recommended links to areas which interest you. Good luck! Traffic radar is a means by which law enforcment has detected vehicle speed since the early 1970s. Traffic radar operates on three high frequency bands: X-band (11.4-22.6 gHz), K-band (24.4 gHz), and Ka-band (33.4-36.0 gHz). Before X-band, there was S-band, but due to the high inaccuracy, it quickly became obsolete. Due to the wide range in frequency of X-band, the radar "signal" spreads out and therefor reads the speeds of all the vehicles at the same time on even a 5 lane highway. This is obviously unacceptable, because this leaves the officer to guess which vehicle has the highest speed. Most radar guns are designed to show the highest speed measured. K-band was developed in the mid 1970s and narrowed the range of frequency for traffic radar. This allowed officers to narrow their guess down to 3 or 4 lanes. K-band also enabled smaller radar antennas, which meant lighter radar guns and also less noticable radar antennas. Ka-band was the answer to the radar detector industry's quick success with their products. Ka-band significantly reduces the range of frequency, thus being able to clock only 2-3 lanes at a time. This is a very large improvement for radar technology. The antennas once again reduced in size considerably, and the radar detector industry quickly began work on new and improved detectors to deal with this new radar band. One method which Radar System manufacturers (Kustom, Stalker, Decatur, etc) used in order to defeat radar detectors was to make each of their radar gun models use a different frequency within the band. For instance, if the gun uses K-band, it could be 31.525 gHz. This proved inaffective quickly, because radar detectors began to scan the entire bands rapidly. The Radar Detectors which were developed to scan entire frequencies were termed Wideband, or superwideband. This simply means that they scan the entire frequencies covered by X, K, and Ka-bands. At first, this proved to be a problem, since they could not scan fast enough, but as Digital Signal Processing was incorporated into the detectors, they became increasingly effective against radar. Seeing a drop in radar-issued tickets, and hence a drop in the number of insurance premiums which were surcharged due to citations, the government founded GEICO Insurance Company funded a project by Laser Technology, Inc. to develop a speed measurement device based on their distance measurement laser device. This was a perfect way for LTI to break out of bankruptcy, and back into the market. They quickly developed the LTI Marksman 20-20 Laser Gun. The deal with GEICO was that in exchange for the grant, LTI would give GEICO a certain number of free Laser guns annualy, which Geico in turn handed over to police departments around the United States with fledgling radar-issued citations. The radar detector industry was quick to react, but their efforts proved short in the begining. The devices they produced did in theory work perfectly, but not on the road. The problem which they soon discovered was that the laser beam was very narrow, measuring a mear 3-4 feet in diameter at 500 feet, which is usually when an officer pulls the triger and obtains a speed reading. The laser detectors simply proved unsuccessful due to the fact that the laser beam spread very little, and also that unlike radar, which spreads all over the area, the laser beam barely scatters when it hits a vehicle. This allows an officer to look through the viewfinder and single out a vehicle with the crosshairs, just like a rifle, and shoot. The problems with Lidar technology are plenty, and this is one fact which the manufacturers would rather the public, and the courts, not acknowledge. The most significant issue regarding Lidar remains in it's use. Lidar can only be used while stationary, unlike moving police radar which an officer can use while moving in traffic. Lidar can also only be used on a very clear day. Any form of debris, snow, rain, sleet, or other objects in the air will almost always render the laser gun completely inoperable. Laser guns have been slow to show up on the roads due to these significant problems, and also the fact that they cost as much as four times the average cost of a K-band radar gun. The police departments can issue tickets for a lower cost with radar, and radar also works in less than perfect conditions. Laser also requires additional certification by the officer, and the road which laser is used on must be certified for laser itself, not simply radar. Radar detection began almost as soon as radar itself hit the roads. The first mass-produced radar detector was called the Fuzzbuster, and became increasingly popular in a very short period of time. This set off many individuals and several electronics manufacturers, mainly CB radio producers, to create the new industry of radar detection. A radar detector is basicly a finely tuned radio. Detectors are tuned to listen in on the different radar bands, and notify the driver when a signal is received. Early detectors were very simple, requiring only to scan the X-band. Then as K-band became more popular among police, the detector manufacturers began to fight back with new and improved technologies, mainly the superheterodyne antenna system. This new technology allowed for far greater range, and improved sensativity. Not much changed in the industry until the arival of the Ka-band radar spectrum. This wide band required detector manufacturers to change detectors to scan a very wide area of the microwave radio band. These detectors became known as wideband or superwideband, since they scanned back and forth the entire Ka-band. Once again the police faught back with Lidar technology, which again required detector manufacturers to produce new and improved detectors. 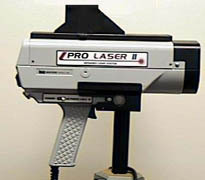 At first laser detectors were sold as seperate units from radar detectors, but the producers quickly developed one device for both functions. One milestone in detection technology came as safety radar was produced. This basicly is when a transmitter is placed at a construction site or a detour, and allows for safety radar equiped detectors to inform the driver of the upcoming emergency vehicle, or weather hazard. At 3000GT Online we recommend the Valentine One Radar Locator as the detector of choice among those individuals who want the best in detection technology. We have concluded this after studying numerous tests by magazines and independent firms, and from our own experiances. The Valentine One is the only detector to employ two highly sensative radar antenna, which allows it to inform the driver of an approaching threat from behind. It also is the only detector to state where the signal is coming from, and how many radar signals are being currently picked up. We recommend the Valentine One web site for more information. Now the Valentine One is #1 worldwide! The 3000GT Online New Zealand Corespondance Kevin Clark now recommends the Valentine One for use in New Zealand. In previous field tests, an additional radar detector within the test vehicle was producing a "leak" of Ka-band radar which hindered the V1's performance. This officially makes the Valentine One Radar Locator the worldwide recommendation for the top radar detector by 3000GT Online. Two types of radar jammers exist: active and passive. Active radar jammers work by transmitting a radar signal on the same frequency as the radar gun. For instance, if the radar gun is transmittning on the Ka-Band frequency at 5mw, the radar jammer must transmit back at least 5mw of the exact same Ka-Band frequency. Technically speaking, an active radar jammer first detects the incomming radar signal, and transmits back that same identical frequency at a higher power than it received. Thus effectively "drowning out" the traffic radar's own frequency, and producing an error on the display. This form of actively jamming traffic radar is a federal offense in the United States due to the fact that it not only jams police radar, but also air-trafic control systems, garage doors, security systems, and ironicly, other radar detectors. Licensed HAM radio operators are not exempt from this regulation. The second type of jammer on the market today is the passive jammer. Passive jammers do not transmit any signal. The principal is that the jammer receives a signal, mixes in a "chirp" and transmits it back to the radar gun, thus making it legal in terms of not transmitting it's own radar signal. This theory works on paper, and only slightly works if you stick a very low powered radar gun right up to the passive jammer. If the two devices are more than a few inches away, the passive jammer is 100% ineffective against the radar. This goes for both radar and laser passive jammers. The most popular passive jammers on the market come from Rocky Mountain Radar. The Phazer and the Phantom (not be confused with the Phantom RCD which is an active jammer) do not work. Numerous magazine tests (see articles below) have proven all Rocky Mountain Radar (RMD) devices inneffective. Recently the FCC added legislation which specificly targets RMD. The new law states that any device, if intented to interfere with police speed measurement, is illegal. Even though passive jammers do not work, they are still illegal under this legislation. Note also that the manufacturers of the active jammer, Phantom RCD, also develop a passive jammer, which is just as ineffective as RMD passive jammers. This passive device is called the Mirage 2001. � Used with permission, Copyright 1998 3000GT Web Team. All Rights Reserved.